When I first ventured to find out about the modern state of fuzzy dice — those plush, vaguely testicular toys some men hang from the base of their rearview mirrors — I posed the question to The Jalopy Journal, a website for and by hot-rod enthusiasts. Who better to shed light on the topic than men dedicated to the very cars that made fuzzy dice cool? “Fuzzy Dice are GAY,” responded one commenter, before the moderators deleted my post altogether. When men can’t express why it is they dislike something, they still resort to calling to it gay. But further investigation revealed fuzzy dice are anything but lame. Fuzzy dice are badass and cool as hell, and an eternal symbol for “This Dude Fucks,” regardless of the owner’s sexual orientation. Fuzzy dice were born in the sky, or so legend has it. Despite their association with classic car culture of the 1950s and 1960s, the phenomenon originated with World War II fighter pilots who carried gambling-related trinkets such as cards, dice and poker chips with them on fighting missions. They served as one of two things — a good-luck totem, or a bleak reminder the pilot was one bad roll away from death. Whichever the case, veterans brought the slightly morbid, possibly optimistic tradition home with them. And in time, it morphed into a mark of affection — the inverse of a high school girl wearing her boyfriend’s letterman jacket. “Back in the 1950s girls knitted them up and gave them to their boyfriends. Kind of like the girls ‘branding’ their guys so everyone else knew they were taken,” writes [all sic] one Jalopy Journal commenter. It wasn’t long before fuzzy dice reverted to their somber WWII origins, though. Greasers co-opted the car ornament as a symbol of “rebellion and recklessness,” and the devil-may-care attitude required of street racers. Not surprising, then, that Han Solo hangs a pair of gold dice in the cockpit of the Millennium Falcon in the first Star Wars installment, underscoring his status as the galaxy’s most daring rogue. It’s a tradition, however, that’s waned in recent decades. “I haven’t seen them in a while, come to think of it,” says 68-year-old Mike Morales, a member of the Classic Lowriders car club in L.A. In large part because dice lost any semblance of countercultural meaning. 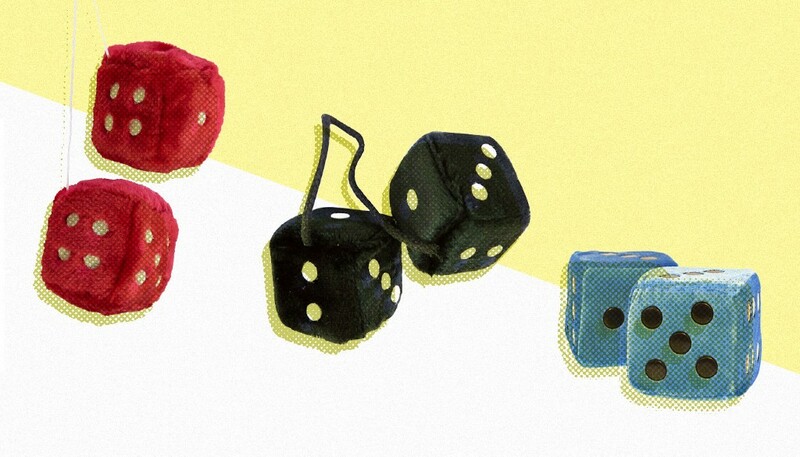 Dice were so mainstream by 1993, for instance, that a Los Angeles Times survey found that drivers who hung them from their rearview mirrors were no more risky than the general population. By the mid-aughts, people were genuinely perplexed as to their former mystique. “I have no idea why the hell those things were so popular, but I do know that many people still hang them in their cars even today,” reads the 2004 Urban Dictionary entry for fuzzy dice. Jalopnik went as far as to engage in some revisionist history and declare that fuzzy dice have always been uncool. That’s patently untrue, though, and the time is nigh for fuzzy dice to make a comeback. After all, there’s nothing more admired in America than military service and a rebellious spirit— and fuzzy dice represent both. I have a pair hanging in my Japanese four-door sedan — a tangible sign that my soul shall never be tamed.